Nitric oxide (NO) is a gas naturally found in the body that conveys information between cells. In the last decade researchers have found that NO is a signaling molecule of key importance for the cardiovascular system, regulating blood pressure and blood flow to different organs. 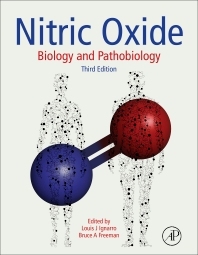 In addition, discoveries surrounding nitric oxide’s role as a principal neurotransmitter moderating erectile function, a pathophysiological negotiator and messenger in inflammation, and a weapon against infections have increased research attention across the fields of biochemistry, chemistry, molecular biology, gene therapy, cell biology, immunology, pharmacology, neuroscience, and physiology. Researchers and students in biochemistry, cardiology, cell and molecular biology, neuroscience, pharmacology, endocrinology. Will also be an interest to academic clinicians in dermatology, neurology, oncology, etc. Louis J. Ignarro, PhD, is Distinguished Professor Emeritus of the Department of Molecular and Medical Pharmacology at the UCLA School of Medicine. He has broad and extensive experience in the molecular and chemical biology of the nitric oxide-cyclic GMP signaling systems. He and his basic research teams have discovered and expanded the production and actions of nitric oxide in mammalian tissues, including the protective roles of nitric oxide in preventing hypertension, stroke and myocardial infarction, and its neurotransmitter role as the mediator of erectile function in humans. For these discoveries, he was awarded the Nobel Prize in Physiology or Medicine.